(Bloomberg Opinion) -- If Deutsche Telekom AG is to be believed, a ban on equipment from Huawei Technologies Co. would slow down its rollout of 5G networks by two years. Even though such an embargo would be a huge burden for the German phone giant, there are factors that might lessen the pain. A delay to its 5G plans might even be welcome. That internal assessment from the telecoms carrier on the impact of a Huawei ban, obtained by Bloomberg News, comes as Germany and other European governments decide on whether to formalize the restriction of purchases from the Chinese telecoms equipment giant. It’s pretty clear that Berlin has more to risk than most by banning Huawei’s telecoms gear. 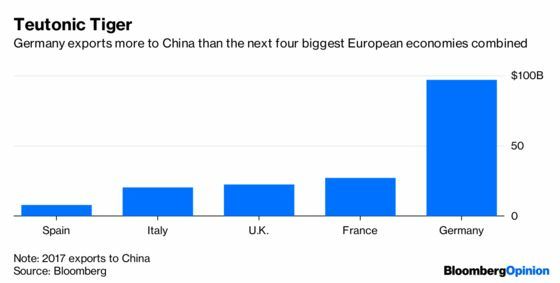 China is Germany’s third-biggest export destination, accounting for almost $100 billion a year. So any retaliatory embargoes from Beijing against German BMWs or machine parts would be felt more acutely than in the U.K. or France, for instance. It’s also worth considering what’s at stake for Deutsche Telekom. The former national carrier is already unhappy with the 5G rollout in its domestic market and a move against Huawei would certainly add to its difficulties – and potentially cost billions. The Germany company appears to have installed proportionately more Huawei equipment than many other carriers in the region. The Chinese supplier has about one-third of the market for telecoms equipment in Europe. But it supplies at least half of the gear used by Deutsche Telekom. This might explain why the latter hasn’t yet followed Vodafone Group Plc, Orange SA or BT Group Plc in curtailing its purchases. Yet there’s a possible upside too. Telekom is locked in an argument with its government over the speed of its 5G rollout. It and other providers say it’s impossible to meet the requirement to cover 98 percent of German homes with download speeds of 100 megabits per second by the end of 2022. So you can see why Telekom would seize on anything that might support the need for a slower pace. The company would much prefer to build the networks at its own speed. It could well be actively weaponizing the Huawei issue to get its way, including getting the government to cut it some slack on the cost of 5G. The leaked briefing document looks like smart positioning. If it succeeds in preventing a German ban, Telekom’s 5G plans won’t be disrupted. And if a ban is imposed, it has a handy excuse for slowing things down.